Bindiganavile Vivek (pictured) is a maize breeder working at the International Maize and Wheat Improvement Center (CIMMYT), based in Hyderabad, India. For the past five years, Vivek and his team have been developing drought-tolerant germplasm for Asia using relatively new molecular-breeding approaches – marker-assisted recurrent selection (MARS), applied in a genomewide selection (GWS) mode. Their work in the Asian Maize Drought-Tolerance (AMDROUT) project is implemented through GCP’s Maize Research Initiative, with Vivek as the AMDROUT Principal Investigator. Driven by consumer demand for drought-tolerant maize varieties in Asia, the AMDROUT research team has focussed on finding suitable drought-tolerant donors from Africa and Mexico. Most of these donors are white-seeded, yet in Asia, market and consumer preferences predominantly favour yellow-seeded maize. Moreover, maize varieties are very site-specific and this poses yet another challenge. Clearly, breeding is needed for any new target environments, all the while also with an eye on pronounced market and consumer preferences. (1) Amazing maize and its maze of colour. Maize comes in many colours and hues. (2) Steeped in saffron: from this marvellous maize mix and mosaic, the flavour in Asia favours yellow maize. Around 80 per cent of the 19 million hectares of maize in South and Southeast Asia is grown under rainfed conditions, and is therefore susceptible to drought, when rains fail. Tackling drought can therefore provide excellent returns to rainfed maize research and development investments. As we shall see later, Vivek and his team have already made significant progress in developing drought-tolerant maize. But they are after a tough target: drought tolerance is dodgy since it is a highly polygenic trait, making it difficult for plant scientists to pinpoint genes for the trait (see this video with an example from rice in Africa). In other words, to make a plant drought-tolerant, many genes have to be incorporated into a new variety. As one would expect, the degree of difficulty is directly proportional to the number of genes involved. In the private-sector seed industry, MARS (PDF) has been successfully used in achieving rapid progress towards high grain yield under optimal growth conditions. 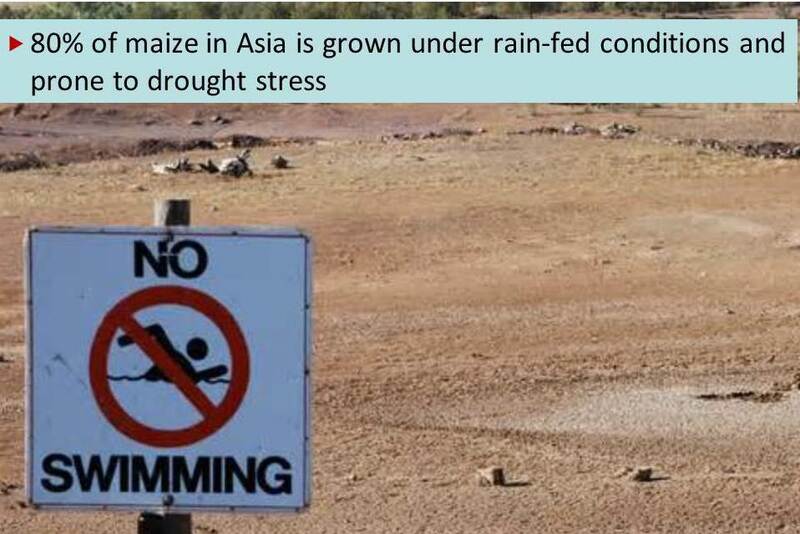 Therefore, a similar approach could be used to speed up the process of introducing drought tolerance into Asian crops – the reason why the technique is now being used by this project. More than India: the AMDROUT project also comprises research teams in China, Indonesia, Thailand, The Philippines and Vietnam. In this photo taken during the December 2010 annual project meeting in Penang, Malaysia, the AMDROUT team assessed the progress made by each country team, and team members were trained in data management and drought phenotyping. They also realised that there was a need for more training in genomic selection, and did something about it, as we shall see in the next photo. Pictured here, left to right: Luo Liming, Tan jing Li, Villamor Ladia, V Vengadessan, Muhammad Adnan, Le Quy Kha, Pichet Grudloyma, Vivek, IS Singh, Dan Jeffers (back), Eureka Ocampo (front), Amara Traisiri and Van Vuong. Vivek says that the area used for growing maize in India has expanded rapidly in recent years. In some areas, maize is in fact displacing sorghum and rice. And the maize juggernaut rolls beyond India to South and Southeast Asia. In Vietnam, for example, the government is actively promoting the expansion of maize acreage, again displacing rice. Other countries involved in the push for maize include China, Indonesia and The Philippines. So what’s driving this shift in cropping to modern drought-tolerant maize? The curious answer to this question lies in food-chain dynamics. According to Vivek, the dramatic increase in demand for meat – particularly poultry – is the driver, with 70 percent of maize produced going to animal feed, and 70 percent of that going into the poultry sector alone. As GCP approaches its sunset in December 2014, Vivek reports that all the AMDROUT milestones have been achieved. Good progress has been made in developing early-generation yellow drought-tolerant inbred lines. The use of MARS by the team – something of a first in the public sector – has proved to be useful. In addition, regional scientists have benefitted from broad training from experts on breeding trial evaluation and genomic selection (photo-story on continuous capacity-building). “GCP gave us a good start. We now need to expand and build on this,” says Vivek. AMDROUT calls in on Cambridge for capacity building. 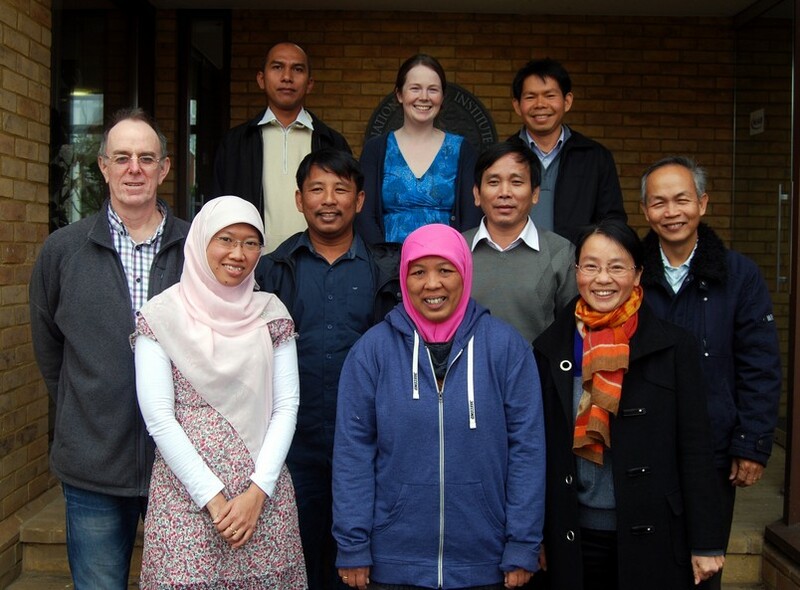 AMDROUT country partners were at Cambridge University, UK, in March 2013, for training in quantitative genetics, genomic selection and association mapping. This was a second training session for the team, the first having been September 2012 in India. back row: Roy Efendy, Alison Bentley (who helped organise, run and teach on the course, alongside Ian) and Suriphat Thaitad.AMDROUT country partners are from China’s Yunnan Academy of Agricultural Sciences (YAAS); the Indonesian Cereals Research Institute (ICERI); the Institute of Plant Breeding at the Unversity of Philppines at Los Baños (UPLB); Thailand’s Nakhon Sawan Field Crops Research Center (NSFCRC); Vietnam’s National Maize Research Institute (NMRI); and private-sector seed companies in India, such as Krishidhan Seeds.Curious on who proposed to whom for this AMDROUT–Cambridge get-together? We have the answer: a Cambridge callout announced the training, and AMDROUT answered by calling in, since course topics were directly relevant to AMDROUT’s research approach. According to Vivek, the AMDROUT project laid the foundation for other CIMMYT projects such as the Affordable, Accessible, Asian (AAA) Drought-Tolerant Maize (popularly known as the ‘Triple-A project’) funded by the Syngenta Foundation for Sustainable Agriculture. This Triple-A project is building on the success of AMDROUT, developing yet more germplasm for drought tolerance, and going further down the road to develop hybrids. Partly through GCP’s Integrated Breeding Platform (IBP), another area of success has been in informatics. Several systems such as the Integrated Breeding FieldBook, the database Maize Finder and the International Maize Information System (IMIS) now complement each other, and allow for an integrated data system. There is now also an International Maize Consortium for Asia (IMIC–Asia), coordinated by CIMMYT, comprising a group of 30 commercial companies (ranging from small to large; local to transnational). Through this consortium, CIMMYT is developing maize hybrids for specific environmental conditions, including drought. IMIC–Asia will channel and deploy the germplasms produced by AMDROUT and other projects, with a view to assuring impact in farmers’ fields. 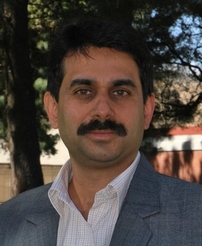 Overall, Vivek’s experience with GCP has been very positive, with the funding allowing him to focus on the agreed milestones, but with adaptations along the way when need arose: Vivek says that GCP was open and flexible regarding necessary mid-course corrections that the team needed to make in their research. But what next with GCP coming to a close? Outputs from the AMDROUT project will be further refined, tested and deployed through other projects such as Triple A, thus assuring product sustainability and delivery after GCP winds up. 3.5 MIN VIDEO – why drought is such a complex customer: a perspective from rice research in Africa. Drought has to do with genetics, physiology and environment, and the interactions between these three elements. As our Maize Research Initiative does not have a Product Delivery Coordinator, Vivek graciously stepped in to coordinate the maize research group at our General Research Meeting in 2013, for which we thank him yet again. Below are slides summing up the products from this research, and the status of the projects then. For this ‘IBP story-telling season’, our next stop is very fittingly Africa, and her most populous nation, Nigeria. Travel with us! Yemi has been working for the last 23 years (since 1991) at Nigeria’s National Root Crops Research Institute (NRCRI) at Umudike in various capacities. After heading NRCRI’s Minor Root Crops Programme for 13 years, he was last year appointed Coordinator-in-Charge of the Cassava Research Programme. But his involvement in agriculture goes much further back than NRCRI: Yemi says he “was born into farming”. His father, to whom he credits his love for agriculture, was a cocoa farmer. “I enjoy seeing things grow. When I see a field of crops …what a view!” Yemi declares. 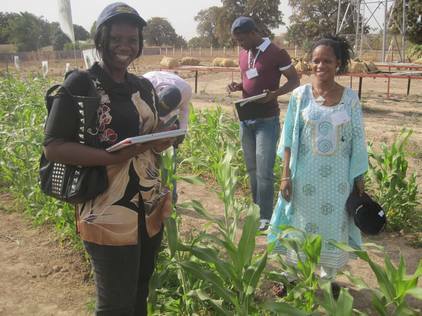 Yemi is also the Crop Database Manager for NRCRI’s GCP-funded projects. He spent time at GCP headquarters in Mexico in February 2012 to sharpen his skills and provide user insights to the IBP team on the cassava database, on the then nascent Integrated Breeding Fieldbook, and on the tablet that GCP was considering for electronic field data collection and management. To meet the farmers’ growing need for improved higher-yielding and stress-tolerant varieties, plant breeders are starting to incorporate molecular-breeding techniques to speed up conventional breeding. Flashback to 2010: GCP was then piloting and testing small handheld devices for data collection. Field staff going through a training session for these under Yemi’s watchful eye (right). But for this to happen effectively, cassava breeders require consistent and precise means to collect and upload research and breeding data, and secure facilities to upload that data into the requisite databases and share it with their peers. Eighty percent of farmers in Africa have less than a hectare of land – that’s roughly two football fields! With so little space, they need high-value crops that consistently provide them with viable yields, particularly during drought. 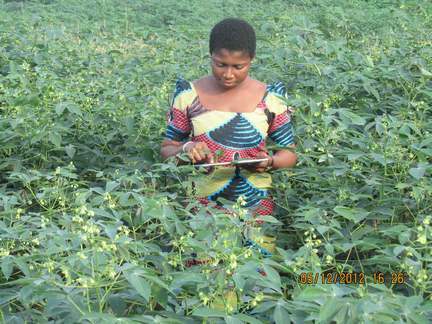 For this reason, an increasing number of Nigerian farmers are adopting cassava. It is not as profitable as, say, wheat, but it has the advantage of being less risky. The Nigerian government is encouraging this change and is implementing a Cassava Transformation Agenda, which will improve cassava markets and value chains locally and create a sustainable export market. All this is designed to encourage farmers to grow more cassava. Enter GCP’s Integrated Breeding Platform (IBP), which has been working closely with NRCRI and other national breeding programmes to develop the right informatic tools and support services for the job. 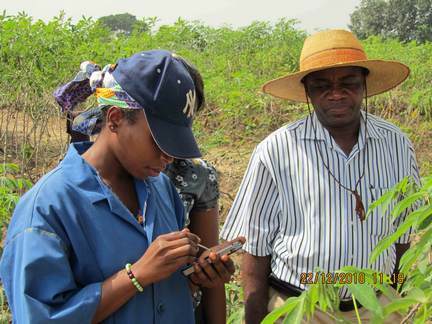 The International Cassava Information System (ICASS), the Integrated Breeding Fieldbook and the tablet are all part of the solution, backed up by a variety of bioinformatic tools for data management, data analysis and breeding decision support that have been developed to meet the specific needs of the users. Fastfoward to 2012: Based on feedback, a larger electronic tablet was favoured over the smaller handheld device. 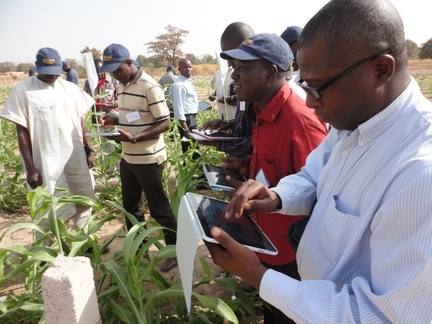 Yemi (centre) takes field staff through the paces in tablet use. “When I received the tablet I was excited! I had heard so much about it but only contributed ideas for its use through Skype and email,” Yemi remembers, echoing a sentiment that is frequently expressed by many partners who have been introduced to the device. “I experimented with the Integrated Breeding Fieldbook software focusing on pedigree management, trait ontology management, template design ‒ testing how easy it was to input data into the program and database.” Yemi noted a few problems with layout and data uploading and suggested a number of additional features. The IBP Team found these insights particularly useful and worked hard to implement them in time for the 2nd Scientific Conference of the Global Cassava Partnership for the 21st Century (GCP21 II), held in Kampala, Uganda, in June, 2012. Slim, elegant, portable and nearly invisible is this versatile tool. A junior scientist at NRCRI Umudike tries out the tablet during the 2012 training session. Yemi asserts that incorporating elements of molecular breeding has helped NRCRI a great deal. With conventional breeding, it would take six to 10 years to develop a variety before release, but with integrated breeding (conventional breeding that incorporates molecular breeding elements) it is possible to develop and release new varieties in three to four years ‒ half the time. Farmers would hence be getting new varieties of cassava that will yield 20‒30 percent more than the lines they are currently using in a much shorter time. Plant breeding is in Arllet Portugal’s blood. Her father (now retired), one of the original field staff of the International Rice Research Institute (IRRI) at Los Baños in The Philippines, nurtured it in her from a tender age. It’s easy to picture him sharing fascinating tales daily with his family upon coming home, after a day of hard work in sun-splashed paddies where he nurtured mysterious and exotic new lines of rice which he was told may hold the solution to world hunger. 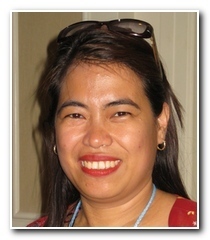 Having lived most of her life under the canopy of IRRI, including 12 years working as a database administrator at the Institute, she decided it was time for a change, and she spread her wings – an adventure that would take her across the oceans, pose new challenges, and plunge her deeper into agricultural research beyond IRRI’s mandate crop, rice. So, in 2009, she packed her bags and headed to Mexico, having accepted a position as a crop informatician for wheat at the International Maize and Wheat Improvement Center (CIMMYT), and then moving over to GCP the following year as Informatics Coordinator, and later on Data Management Leader of GCP’s Integrated Breeding Platform (IBP). The Platform is a one-stop shop for crop information, informatics tools and services designed to propagate and support the application of modern approaches to crop breeding, particularly targeting developing countries. Arllet’s greatest daily challenge is convincing crop breeders and other crop researchers that their research data are just as important as their core research work, and they should therefore dedicate as much time, energy and resources to managing data. Arllet explains that this age-old system is not necessarily wrong, but it wastes valuable time, is insecure and limits the capacity of breeders to efficaciously reuse and also share their data with colleagues – a practice by which they would help each others’ work. “We are trying to show breeders that their ‘system’ can be enhanced and streamlined if they enter data straight into a computer when they’re in the field and then upload them into an online database,” she says. Arllet explains that such improved systems have been in place for decades in the developed world, particularly within the private sector but not as prevalent in the developing world or public sector. This is largely attributable to the high cost of the equipment and informatics tools, and a lack of personnel with the appropriate skills to make use of the tools. Through a collaborative effort bringing together a wide array of partners, with funding primarily from the Bill & Melinda Gates Foundation, supplemented by the European Commission and the United Kingdom’s Department for International Development, IBP is working to overcome some of these barriers. With the release of the Integrated Breeding (IB) FieldBook, the foundational informatics tool for the proposed system, Arllet believes a giant step has been made towards achieving this objective. What is the IB FieldBook? The IB FieldBook is a user-friendly computer program that facilitates the design of field trials and produces electronic field-books, field plans and labels. It collects together – in a single application – all the basic tools that a plant breeder requires for these diverse but intertwined functions. Live demonstration: Taking the tablet through the paces at a training workshop for research technicians in January 2012. The regional workshop for West Africa (in French and English) was hosted by L’Institut d’économie rurale (IER) at Sotuba, Mali. A similar workshop was held in Ethiopia in English for the Eastern and Southern Africa region. 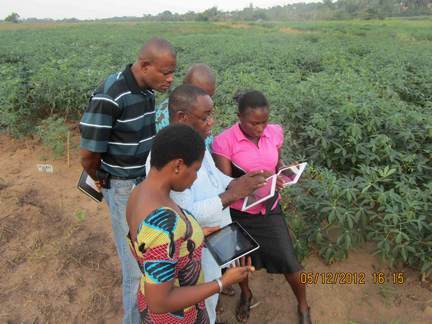 She and her team have been conducting training workshops on data management for breeders at which they demonstrate the IB FieldBook and the use of handheld electronic devices (such as tablets) for data collection, which breeders can conveniently take to the field with them and directly enter the phenotyping data they would normally capture in paper field-books. ‘SHARP’ data – shareable, available, reusable and preservable. Left to right: Diarah Guindo (IER), Ardaly Abdou Ousseini (L’Institut national de la recherche agronomique du Niger, INRAN) and Aoua Maiga (IER) at the January 2012 training at IER Sotuba, Mali. Plant breeders are collaborating more often than they used to, and also drawing much more on specialised experts for each stage of the crop variety development chain. These experts are able to verify the data to make sure they are correct, do their job quickly and pass the data onto the next expert, an economical resource- and time-efficient process. However, as Arllet explains, consistent and secure data management is key to the success of these collaborations. Arllet and her team of four consultants are currently helping breeders from all around the world upload their historical research data into the central crop databases of the Integrated Breeding Platform, a massive task given the issues of trust, language barriers, slow internet connections, inadequate computer skills and the sheer volumes of the data. However, these are challenges that are becoming easier to handle with greater awareness and the enthusiasm that comes with that. What next, and what difference will it make? Adoption and broad use of the FieldBook will of course also make the process easier in the future, enabling a single step uploading of phenotypic data – hence setting breeders free to get on with their work without the wastefulness of having to enter and re-check the data multiple times. See videos below: ‘ Masses of crop breeding information: How can it be handled?’ and “Why use IBP’s breeding and data management tools?“, which, in the view of one of our Australian partners, explains why IBP is particularly important for developing countries, and why they have a comparative advantage compared to the developed world.